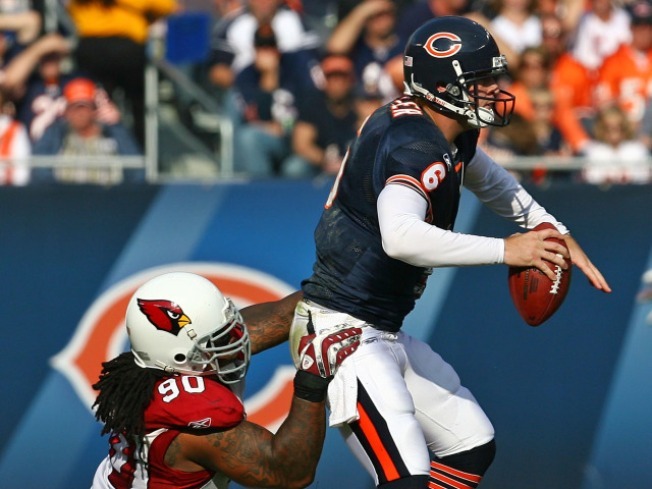 The Cardinals hurried Jay Cutler on defense while Kurt Warner and company built a huge first-half cushion. Trailing your opponent 31-7 at halftime isn't a very good way to win football games. Just ask the Bears. The Cardinals' Kurt Warner inflicted that damage on the Bears in the first half, dicing Chicago's secondary for four early touchdowns on the way to a 41-21 win at Soldier Field. Chicago's Jay Cutler tried to keep pace with Warner, throwing for three touchdowns of his own, all of which went to tight end Greg Olsen. But the Bears' lack of a running game -- they finished with 55 rushing yards on the day -- kept the Bears' possesions short and Warner's opportunities frequent. The Cardinals' Larry Fitzgerald finished with 10 catches for 123 yards and two touchdowns. The Cardinals were without No. 2 receiver Anquan Boldin; his replacement, Steve Breaston, caught five passes for 66 yards and a touchdown. The 41-21 loss marks the second time the Bears have given up more than 40 points in the past three weeks. The first came in a similar blowout against the Bengals in Week 7. Taken together, Bears fans can be forgiven for thinking their team is not even mediocre, especially on defense.